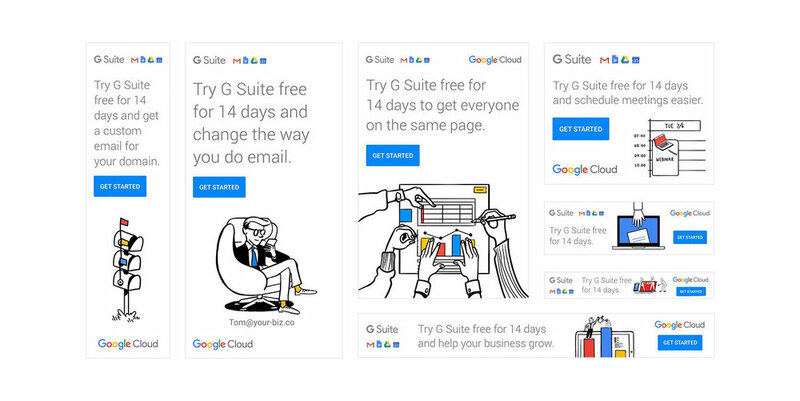 In the Fall of 2016, Google rebranded their communication/collaboration tools (G Suite) and launched the All Together Now campaign. In 2017, we were tasked to evolve and build upon the All Together Now tagline. The focus was on small businesses (SMB) and very small businesses (VSB) with a digital-only campaign that we translated to animated banners and short animated sequences. I worked with 8 illustrators and animators from around the world to craft new concepts, illustrations, and animations. The project spanned 8-10 offices globally, and was a 4 month engagement. Select lo-fi concept sketches by Studio Muti, Matt Blease, and Mark Long. I worked closely with a copywriter, Google stakeholders, and the illustrators from concept to finalization. This is a small sample of banners, the full set is 70+ banners, and videos.